Imayna Caceres: Anti*colonial Fantasies: Where do you learn this? Anti*colonial Fantasies: Where do you learn this? A residency form lands in the middle of a tropicalia landscape. A river runs through the forest and clouds rise up above a volcano. 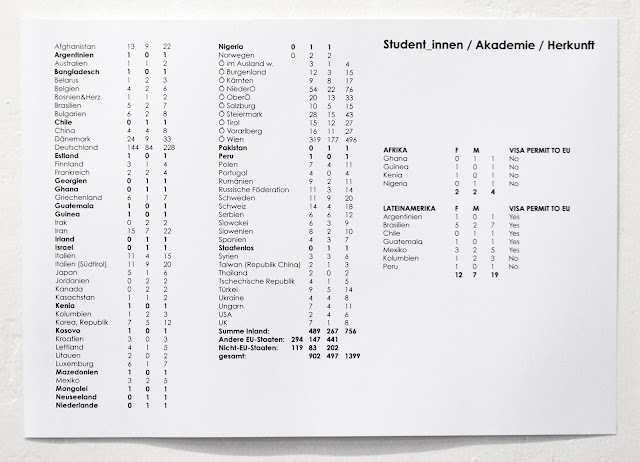 The painting is displayed next to a list of countries the students at the Academy of Fine Arts come from. It includes the number of students from the continents of Africa and Latin America, and whether they need a visa to come to Austria. Displayed under the title "Where Do You Learn This?" I began painting this work at the end of 2015 under the title Anti*colonial Fantasies. 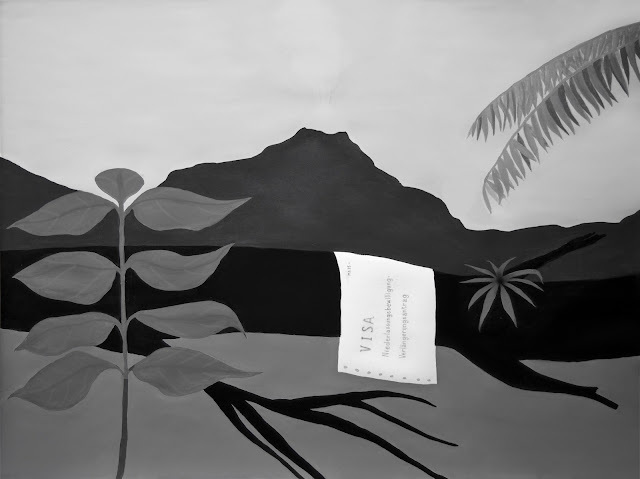 The images of Abya Yala that were produced following what came to be mythically known as the discovery of America belong to a particular genealogy of paintings, in which the depiction of the so-called New World was marked by the colonial fantasies of the European men that drew them—who had taken on the task regardless if they had been there or not. They produced and fostered the imagination of lustful and dangerous lands they described as virgin. A soil where no man had set foot before, and where devoid of technological or human presence, nature was pure and absolute: a sensual paradise of colonial projections. On the basis of these fantasies, the humanity of the inhabitants of Abya Yala was called into question, and it was argued that they were different. “Are they humans?” was one of the questions articulated in the 16 c. debate concerned with establishing whether these peoples were to be understood as falling under the criteria of law and religion, as possessing rights, and as subjects worthy of the protection by the Spanish crown. The statistics on the “country of origin” of students at the Academy of Fine Arts Vienna display the diferential access we have to roam the planet. There are 4 students registered from Africa, a massive continent of 1,216,000 million people. There are 22 students—several of whom are enrolled in post-graduate programs—from Latin America, another large continent of 422.5 million people. The numbers correspond to the hierarchy of mobility and visa-free travel where nationals of ex-colonial empires hold a passport that grants them the privilege of unhindered travel. The aftermath of colonialism categorizes nationals from ex-colonies as migrants, as a different class that is subject to strict migration laws, exhausting chains of paperwork and bureaucratic systems.